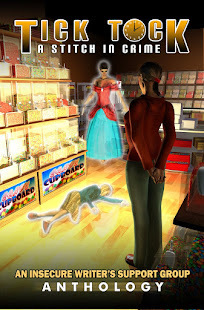 The Ninja Librarian: And... The Ninja Librarian is out of the mountains! And... The Ninja Librarian is out of the mountains! 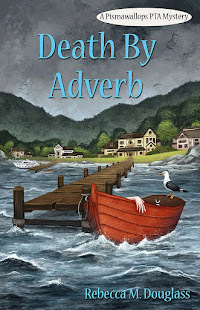 To no one's surprise, I don't have a story ready to go for my Friday Flash Fiction. Nor are my photos edited, since I just got home today. But I've picked a few to edit quickly and allow me to share a little teaser. Here's the big story: on July 11, we packed up half our belongings (roughly) to move into storage, part of our plan to be out of our house by sometime in August. We paid our boys to take a couple of days off from work, and drove to my brother-in-law's house about 3 hours away, where we left the stuff. The next morning we sent our boys back home with our car and the U-Haul (because right now a round-trip rental from SF is cheaper by a wide margin than a one-way rental), and my husband and I borrowed the parental camper van and headed for the hills: the really big hills known as the Sierra Nevada. We spent 4 days dayhiking, to get used to the altitude, then did an 8-night, 9-day backpacking trip (was supposed to be one night longer; that's another story for another day). 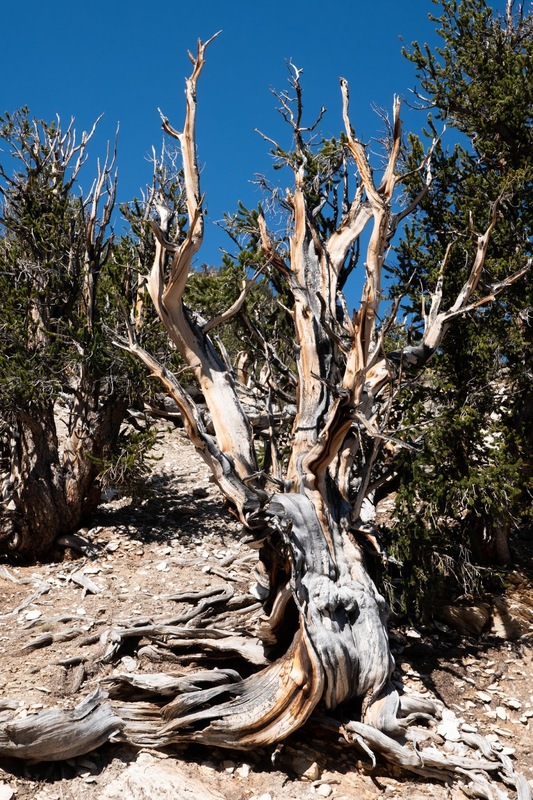 One of the trips we did was to the bristlecone pine forest on White Mountain (across the Owens Valley from the Sierra Nevada). We hiked a 4 1/4 mile loop that passed among some of the oldest living things on earth (the oldest tree, known as the Methuselah Tree, is supposed to be in there somewhere, but for obvious reasons they don't identify it. People can be stupid and the tree can't run away). We spent the night at the Grandview Campground, which is a fancy name for a primitive National Forest campground. We arrived after dark and had a fun time trying to figure out what were campsites and what weren't, and which were occupied. Our apologies to anyone we disturbed! 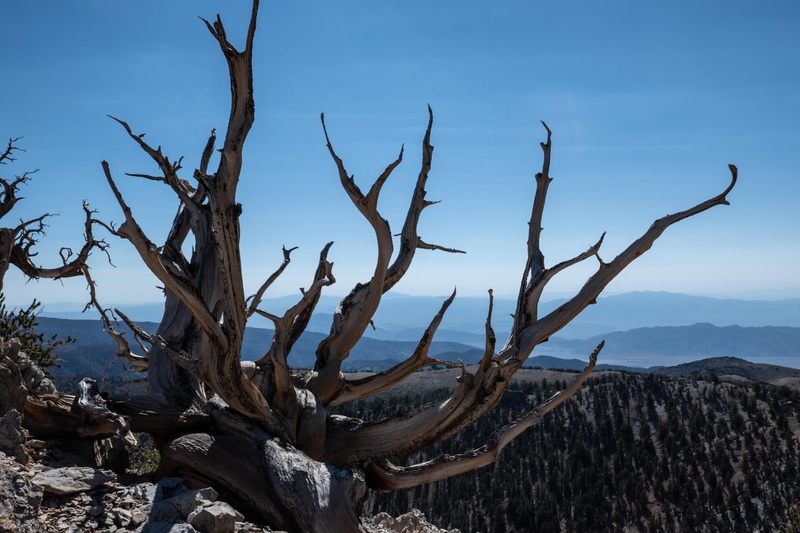 The next morning, we drove the last few miles to the bristlecone grove, with a stop at a viewpoint with an amazing view of the Sierra. It's a dry year. That's a pretty bare mountain range, and there's a hint of the grey-brown pall of smoke that would develop in a week into a view-destroying cloud. We learned a number of things on our hike, which had a numbered trail guide. One of those things (not in the guide) was that it was already hot at 9 a.m., even at 11,000 feet. Another was that the trees growing in "easy" places, like these, grow fast, straight, and tall. 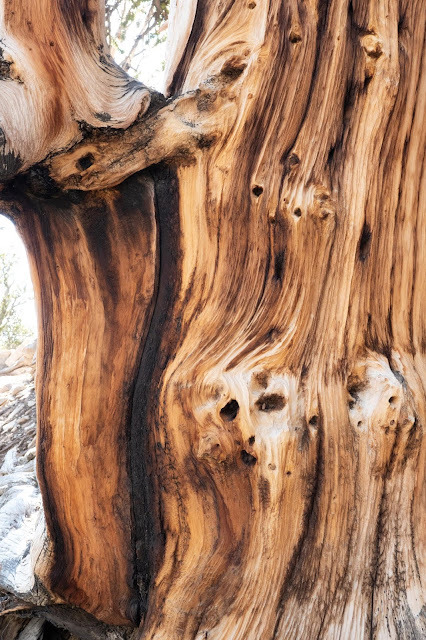 But they don't grow tough, and their softer wood is more subject to disease, bugs, and other arboreal disasters, so they don't become ancients. Happy trees, unaware they will not live for centuries. 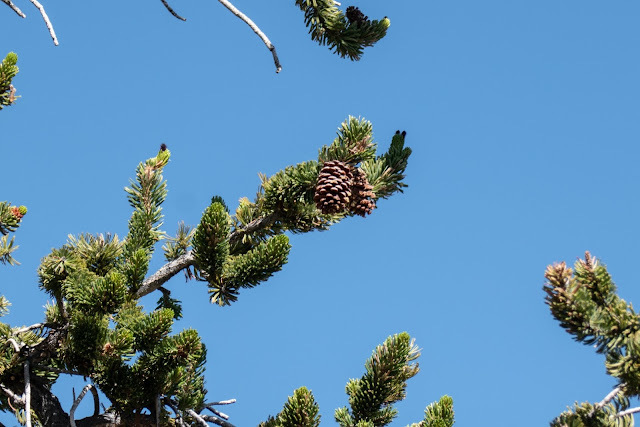 On the slopes where nothing else will grow (often dolomite soils, which are very alkaline), the bristlecone pines can live for centuries. 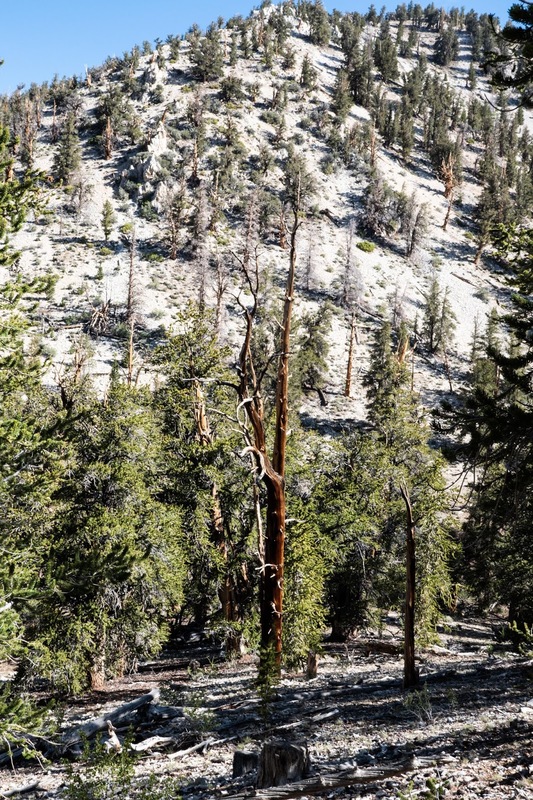 Millenia, in fact--many of the trees in the Methuselah Grove are 3-4 thousand years old. As long as some small strip of bark remains, they will produce needles and cones, and continue to live and (verrrrry slowly) to grow. About those cones. 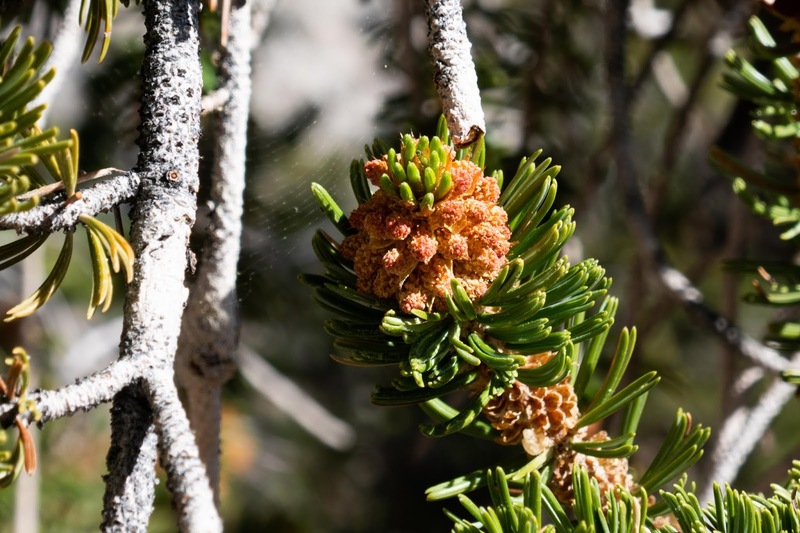 Bristlecones produce male and female cones, and will do so even when 4000 years old, thus ensuring that somewhere along the line they reproduce successfully. Male cones. These make the pollen. Female cones. You can't see the bristles on these (possibly because they are at the wrong stage of the 2 year life cycle of the cone). They produce the seeds. Those needles don't drop every year or two, either, as other pines do. They may hang on for 20 or 30 years. No doubt when you live for thousands of years, that's plenty often enough to refresh your look. It also reduces the energy they need to survive, ensures they will be able to photosynthesize even in a bad year, and keeps the forest floor so free of litter (duff) that fires can't spread, thus protecting them in another way. Even when the trees finally die (as this one appears to have done), they can continue to stand for centuries or more, until the soil erodes from under them. When they do fall, they don't decay in the dry air. 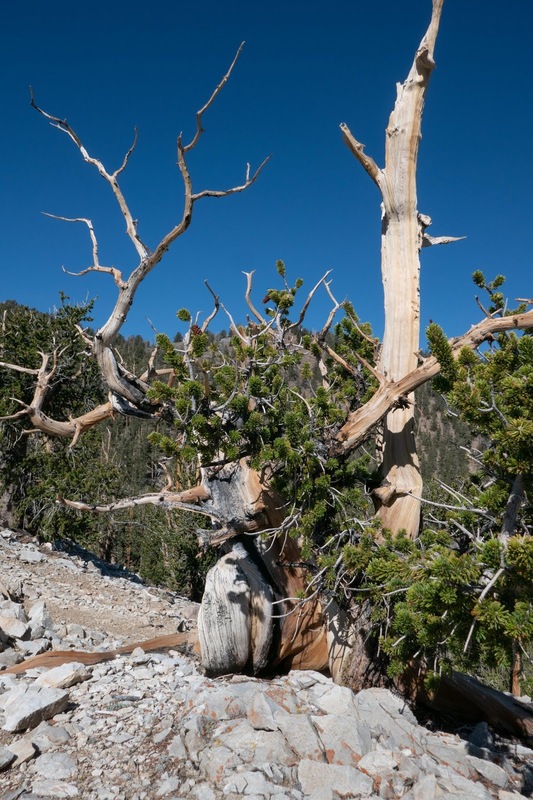 Dead and downed trees have been found that first began to grow about 13,000 years ago, or pretty much as soon as the ice retreated and the Holocene began. The mountains and valleys of the north end of Death Valley National Park are visible from the ridge here. The extremely long lives and failure to decay of the trees revolutionized dendrochronology, the science of dating things by tree-ring evidence. And that science, in turn, forced a rethinking of human history, and a recognition that civilizations grew up around the world on their own, not all as an expansion from the Tigris-Euphrates Valley, as I was taught in school. Currently, scientists have a continuous tree-ring record going back 9000 years, and need just the one right tree to fill a gap, allowing it to go back 13,000 years. Somewhere in this neighborhood lives the oldest tree. Any of these could be a few thousand years old, too. Finally, in addition to all that science, the trees are just beautiful in their own right. The sun was high and the light harsh by the time we got around the trail, so the pictures don't do the trees justice. But the wood is multi-colored, possibly due to interactions of fungi with the resins in the wood. Whatever the cause, the result is beautiful. Hope you enjoyed this little excursion to the White Mountains, and the Ancient Bristlecone Pine grove! Stay tuned--I finished a few books on the trail, so even if I don't have new fiction, I'll have some book reviews! Glad you had a good time, with adventures! The trees are wonderful. I could admire them for years. Me, too. And they have the patience to sit there and let us do it! California is a big state, with a lot of variety. It's a good day's drive from SF to the eastern Sierra, but well worth taking the time.